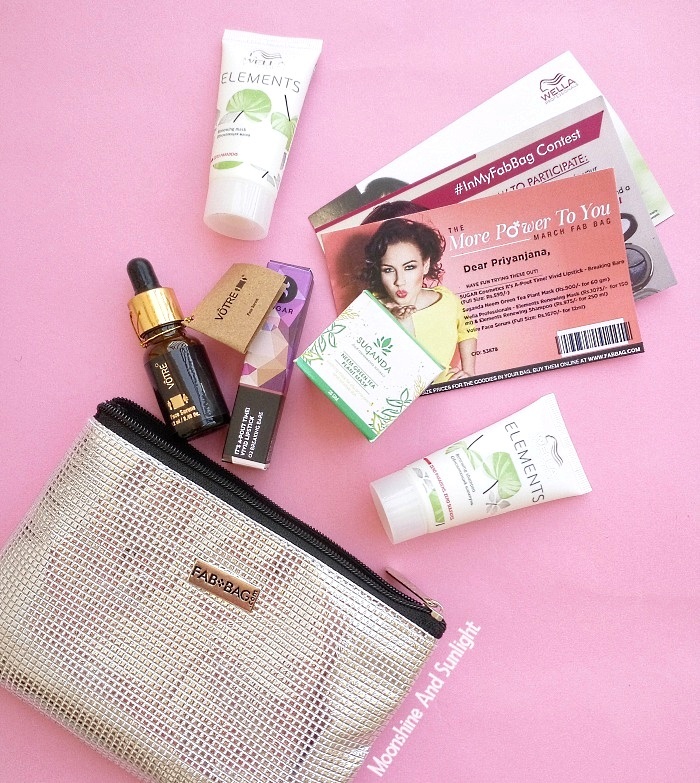 The beauty box subscriptions are doing an awesome job these days and the March 2016 Fab Bag is "Da bomb" and for this Fab Bag team needs a pat on the back! Yep! I am in love with the bag this month, no kidding! 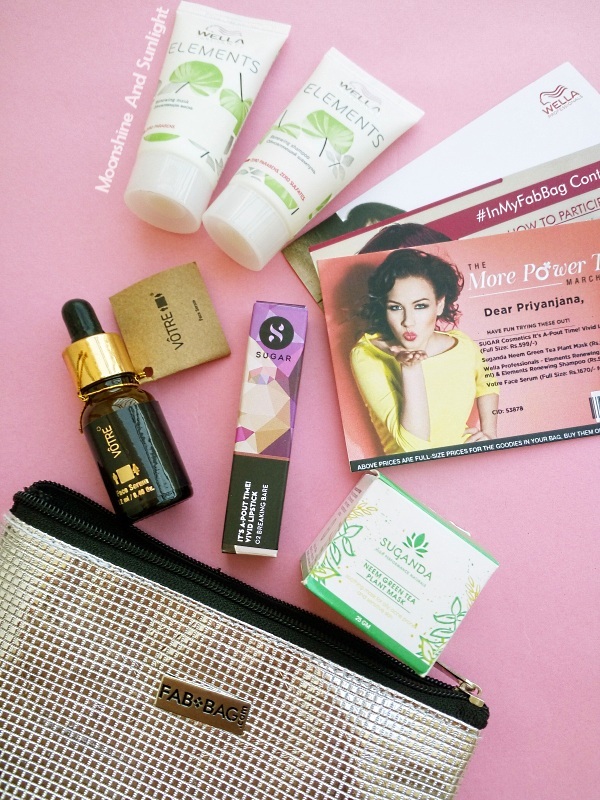 The More Power To You Fab Bag is the name of March 2016 fabbag. The bag itself is a silver pouch with chain and would come in handy whenever I need a makeup bag in the future! 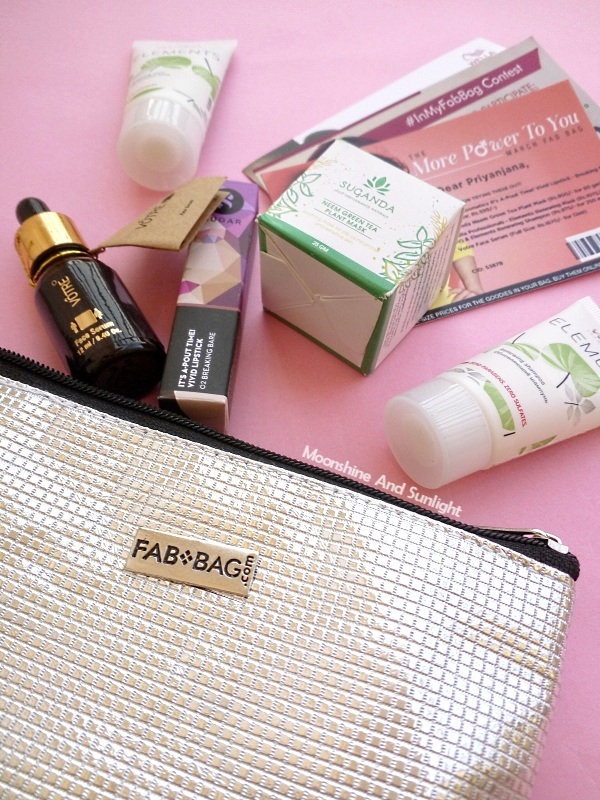 Right now, I am using the July 2015 Fab Bag as my makeup bag. Now! Why do I love this bag so much?? Becaause , this bag contains products worth almost 3000 INR , has 2 full size products and one of them is a New Launch and has a nice variety!!! What more could one ask for, at just 599 INR (which comes down to as low as 413 INR / month if you have an annual subscription! ). Sugar Cosmetics It's A-Pout Time! Vivid lipstick (Full Size, 599 INR) - This is a new launch from Sugar Cosmetics. 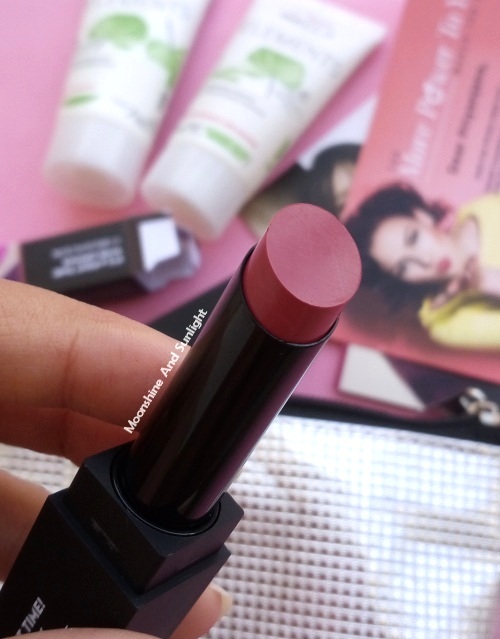 They have launched 4 shades in this range and I luckily received the shade I wanted the most! 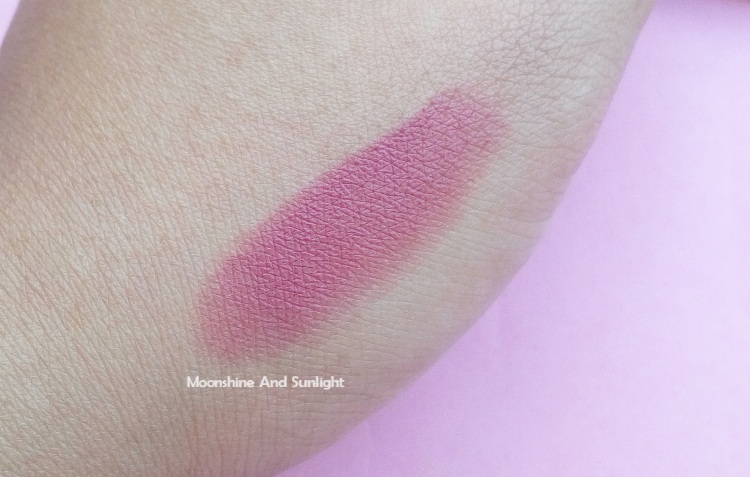 This is beautiful and wearable mauve-y pink and the shade is called Breaking Bare. The other three shades are beautiful too, especially the berry shade they have! Votre Face Serum (Full Size, 1670 INR) - I am on a facial oil/serum marathon right now and I am praying very hard for one of these to work on my pimples and marks! This is a vegan and cruelty free products , so *cha ching* Brownie point! Fab bag had this in one of their previous bags and I am so lucky to have received this in the March bag. The next two products are samples but are quite decent in size! I was thinking of giving the wella elements range a try, since I got my hair colored and now I can try both Wella Professionals Elements Renewing Mask and Wella Professionals Elements Renewing Shampoo. (30 ml sample each). The last product is again something I am hoping will work on my pimples! Suganda Neem Green Tea Plant Mask is a face mask which has organic tea tree and neem, so *fingers crossed*! This sample is of 25g and the full size contains 60g of the product. I genuinely love the variety of the March 2016 Fab Bag! Two different types of skincare products, two samples for hair and one newly launched make up product. Plus, there is no tiny sample. I would, quite obviously, recommend you to buy this bag! After all, you are getting all this at only the price of the lipstick! Do let me know what you receive!! And also if you already have !! Great effort... superb organic content. If you are interested in peacock pictures do have a look.